A beautiful 3 bed/2 bath apartment of modern construction in the popular Costa Blanca area of Spain available at per night rate during high season and €660 per month from mid-September to March, utility use extra for both seasons. It is close to a variety of restaurants & pubs. 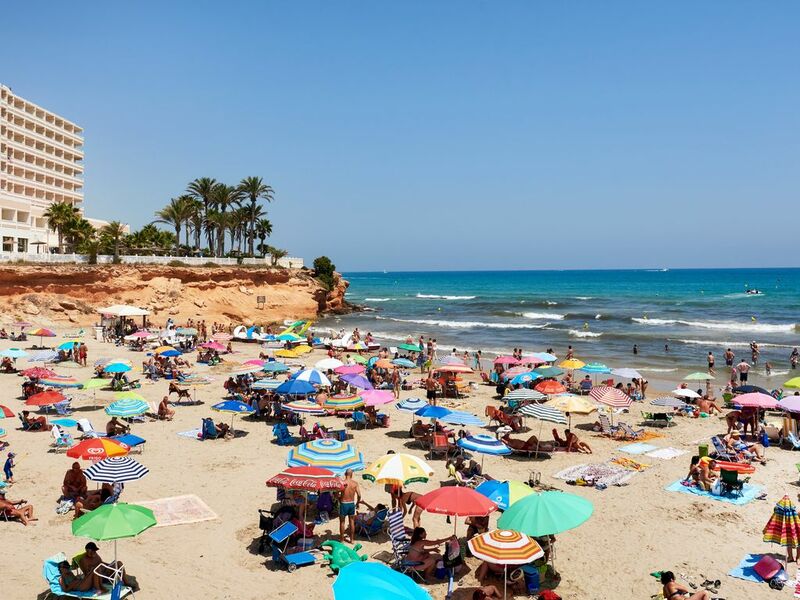 It is near to massive La Zenia boulevard shopping complex and beaches are all around. The apartment is also conveniently located near the 3 popular golf courses. The PARKING is outside the apartment complex ON THE STREET. Heating through air-conditioning wall units. Parking outside the apartment block on the street. A round glass dining table sits four. Terrace with large dining table and 6 chairs. There are 3 golf courses nearby. We rented the apartment for a three month stay December to March to escape the UK winter! A modern, comfortable and fully equipped apartment located within easy reach of the new La Zenia shopping centre and the local beaches. We also enjoyed the use of the onsite Jacuzzi and Sauna! Thoroughly recommended. It was a pleasure to welcome Jeremy and his wife to our holiday home for the winter months. Jeremy kept me informed about their well-being and was responsive and disciplined in all aspects of communication to timely payment. I had then treated them with the onsite Jacuuzi and Sauna which are generally for use of Apartment owners only! I love to welcome back Jeremy and his family friends in future. Thanks for your honest feedback which will help other holiday makers looking in the area. It was great to have you and your family stay at our place and hope to see you again. We came to know about the closure of the supermarket recently and hoping that there will be a new one fairly soon. La Zenia Boulevard which is the biggest shopping mall and has children/kids activity is 2.8 km. The electricity use is not included in the rental and a separate deposit of €100 is payable to owner at the time of booking. The electricity is charged as per actual at €0.40 (40 cents per KWH). The cost of water and Wifi is additional and is fixed at €66.